Dimensions RM is full-featured and proven requirements management solution that enables efficient collaboration of all stakeholders in the modern system and software development. With its requirements process support and lifecycle integrations, Dimensions RM enables real end-to-end traceability for complex development projects. Requirements reuse, variant management, requirements branching/merging or functional safety standards like ISO26262 are easily supported in Dimensions RM to meet today's product development challenges. Through many direct integrations to application lifecycle tools and the support of various integrations, Dimensions RM can easily be integrated into many tool landscape. 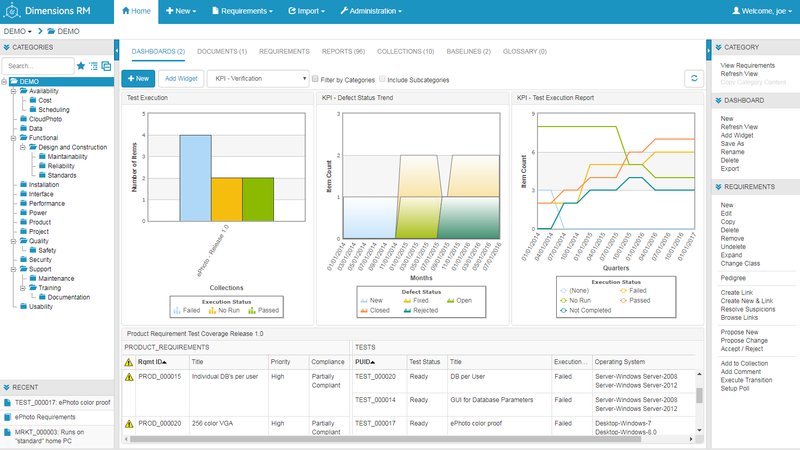 Coordinate requirement definition and approvals with all stakeholders and efficiently manage change across complex projects, geographically dispersed development teams, and multiple releases. Dimensions RM supports perfectly traditional and agile requirements management with a sweet spot on hybrid approaches integrating both worlds with traceability. For a decade the requirements for our program were managed by a brilliant and dedicated MD using, what he hoped, might be the latest version in a long line of Excel spreadsheets. Since we began using Dimensions RM we not only know where our requirements are, but we know which have been implemented, and when, and which are targeted for release. Dimensions RM has given us the ability to globally collaborate as a project team during the business analysis phase. With RM, we are able to manage requirements, in an agile fashion, quickly responding to the business’ needs. Every project needs to follow either our corporate Waterfall or Agile process and all requirements we are gathering must be available in a single source of truth which is provided by Dimensions RM.